1914 - Today, Mother’s Day was declared a national holiday in the U.S. by President Woodrow Wilson. This holiday went from a day for peace to a sentimental and commercial holiday, but is still observed in appreciation and in honor of all mothers. 1928 - Today, Barbara Ann Scott was born in Ottawa, Canada. She went on to become an Olympic gold medalist for figure skating in the 1948 winter Olympics. She was known as “Canada’s sweetheart” . She was also the first citizen of a non-European nation to win a world championship in skating in 1947. 1919 - Today, Ella Grasso was born in Windsor Locks, Connecticut (of Italian immigrant parents). She was a woman of many “firsts”. She went on to become the first woman in the United States to be elected as a state governor (of Connecticut) in her own right, and not as her husband’s successor. She served in the U.S. Congress and in several other offices as well as follows: She became the first woman elected as Floor Leader of the House in 1955; she was elected Secretary of State of Connecticut (and re-elected ); she was the first woman to chair the Democratic State Platform Committee; and she was co-chairperson of the Resolutions Committee for the 1964 and 1968 Democratic National Conventions. 1896 - Today, Mari Sandoz was born in Sheridan County (near Hay Springs), Nebraska to Swiss immigrant parents. She went on to become a writer, historian, lecturer and teacher. She was primarily known for her writings and authority on the Plains Indians series. These series stand as her central achievement due to its singular interpretation of the High Plains region from the stone age period to the 20th century. Her series left us with a richer appreciation of our past and a clearer vision of our future. She was subsequently inducted into the Nebraska Hall of Fame. Here are the titles of some of the series: The Battle of Little Big Horn; The Buffalo Hunters; The Cattlemen; Love Songs to the Plains; The Beaver Men; Cheyenne Autumn; Foal of Heaven; The Great Council; Hostiles and Friendlies, etc. etc. etc. Well, it seems like this Women's History thread, which I began on May 12th, 2006, has now gone full circle. The last post was May 11th, 2007 - a full year of posting about intelligent, strong and resourceful women, whose contribution have made a significant difference in the way that women and women's causes are viewed today. I hope you have all enjoyed it and it was my pleasure to have brought enlightenment and awareness of women's causes to all of you here. Thank you Morticia, for this thread, and your devotion to it... I have enjoyed your updates to the history of Great Women a lot... Do you have plans for a sucessor to this thread? Thank you for your kind words, Aelfgifu. I'm planning to write about ALL influential women and women's awareness issues as they become available. There are sooooooo many outstanding women who have contributed to the causes afflicting women today and throughout history. But, I'm always open to any suggestions you and all others may have! Thank you Easternight and Knight and I'm glad you enjoyed it. The pleasure was all mine! 1923 - Bea Arthur born - best known for her character of "Maude" and her role in the "Golden Girls"
1643 - Anne of Austria is appointed to the Regency Council which will rule France during the minority of Anne's son, King Louis XIV. 1536 - Anne Boleyn, second wife of King Henry VIII is found guilty of treason and condemned to death. 1567 - Mary Queen of Scots marries James Hepburn, Earl of Bothwell, at the Great Hall of Holyrood. 1727 - Death of Catherine I, Tsarina / Empress of Russia - she was 44yo and was succeeded by her son Peter. 1770 - Marie Antionette marries the French dauphin, who will become King Louis XIV of France. 1547 - Annulment of the marriage of Catherine of Aragon and King Henry VIII is heard in an ecclesiastical court. 1536 - Execution of Anne Boleyn - she is beheaded on Tower Green by a swordsman brought in from France. 1714 - Succession of Queen Anne of Great Britain. 1789 - Dolley Madison (Dorothea Payne Todd Madison) born - First Lady 1809-1817, wife of James Madison, fourth President of the United States. Liz Claiborne (nee Anne Elisabeth Jane Claiborne) was born on March 31st, 1929 in Brussels to a banker father and a homemaker mother. Claiborne was a direct descendant of the first governor of Louisiana (USA), William C.C. Claiborne. At age 18, Liz Claiborne entered a design contest in the magazine, Harper’s Bazaar, and won. She went on to become an icon in the fashion world, and spoke about the lack of opportunities for women to achieve equality in the work field. She built a designing empire, selling everything from earrings, necklaces, clothes, shoes to perfumes. May she rest in peace! Former First Lady Lady Bird Johnson died aged 94yo. "Lady Bird Johnson, the former first lady who championed conservation and worked tenaciously for the political career of her husband, former President Lyndon B. Johnson, died Wednesday, a family spokeswoman said. She was 94. Lady Bird Johnson returned home late last month after a week at Seton Medical Center, where she'd been admitted for a low-grade fever. Her husband died in 1973. She died at her Austin home of natural causes about 4:18 p.m. CDT, said Elizabeth Christian, the spokeswoman. She said she was surrounded by family and friends. She was hospitalized with a stroke in 2002 that left her with difficulty speaking. But even after that she continued to make public appearances and in May attended an event at the LBJ Library and Museum featuring historian Robert Dallek." July 13th 1908 - Women compete in the modern Olympics for the First time. 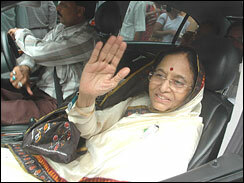 On July 21st, 2007, 72-year-old Pratibha Patil (a lawyer) became the first female president of India. This is a huge milestone for the women of India and she won nearly 2/3rd of the votes. 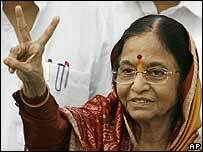 Congratulations to Ms. Patil on a great victory!!!! Fatima Jinnah born this day. She is referred to as Khatoon-e-Pakistan ("Lady of Pakistan"). Involved in politics, she also devoted her time to the welfare of the Pakistani people. 1683 - Maria Theresa of Spain, Queen of France died. 1985 - Julia Hall Bowman Robinson, eminent mathematician. Today, Tammy Faye Baker Messner succumbed to colon cancer. She is best known for her excessive makeup, mascara, false eyelashes and tattooed eyebrows. Together with her first husband, Televangelist - Jim Baker, she co-hosted the PTL Club on tv. She authored a couple of books, was on a tv reality show (The Surreal Life), was an evangelist and a singer. May she rest in peace!